Hey everyone. Over the last few weeks, every night when I've gone to paint my nails Ive been watching Breaking Bad from the very beginning. I had never watched it before, and it's been so great being able to sit down and watch and episode almost every night when I paint my nails. I'm just about to head off to paint my nails tonight and watch the very last episode. It's been a fun ride. For today's mani I created a circular gradient using Kleancolor metallic polishes. I used Kleancolor metallic gold and mango and coffee addict. 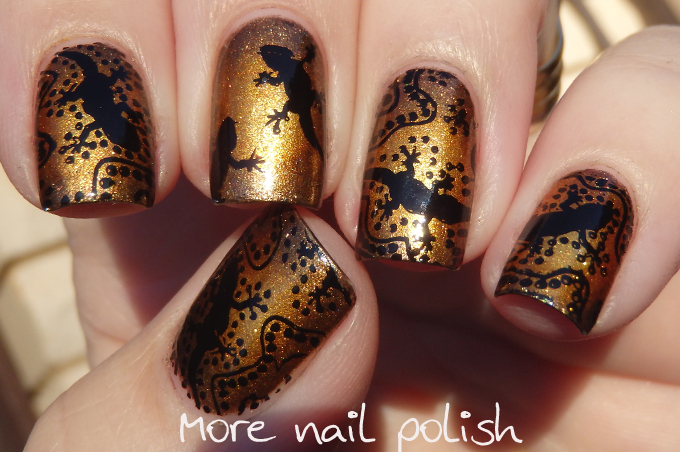 The little geckos are stamped using Mundo de Unas black and Moyou Explorer 06 plate. I used the image as is, facing different directions on all my nails except the middle finger. On the middle finger I cleaned up all the extra dots and squiggles on the stamper before squishing it onto my nails, this created just two clean little black geckos. What do you think? I love how this one turned out. 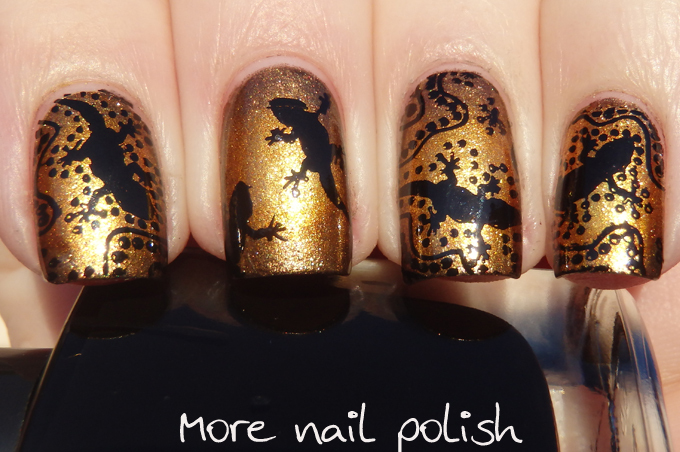 The colours I used are very warm and earthy and seem to match the gecko and outback feel of the mani. 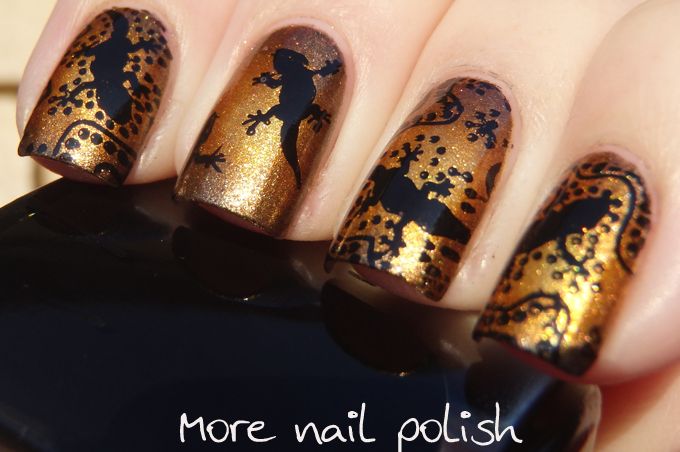 Fantastic nails - black geckos on circular gradient is beautiful combination! And Breaking Bad is one of the most entertaining tv shows I've seen, have fun with the last episode :). I love this! 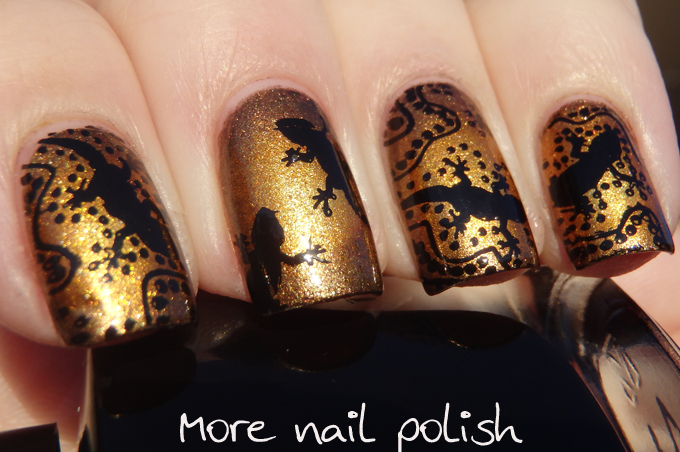 I adore lizards and the stamping is great!